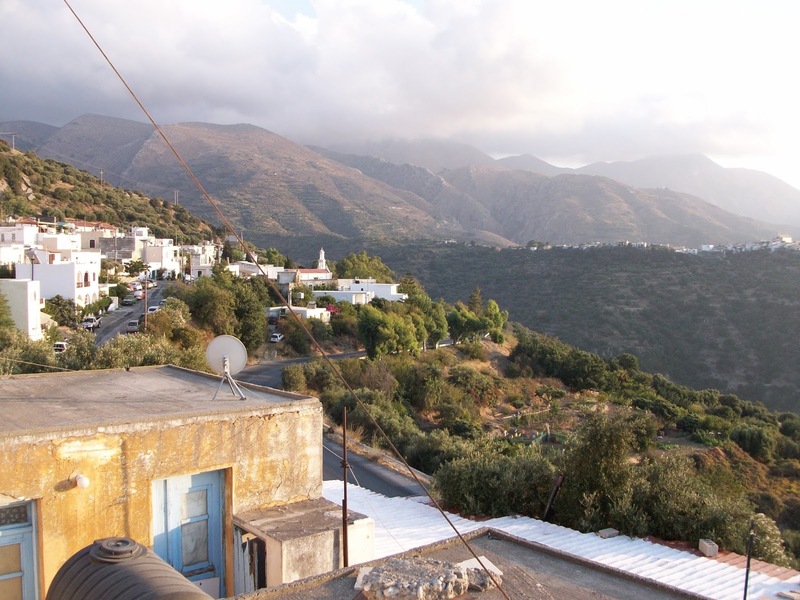 A group of us had a recent trip from Heraklio to the picturesque village of Myrsini, Lasithi Region. We were going to the opening of a friend's exhibition in a new gallery space opened by a collective of locals. It was a really nice event, with quite a lot of people, considering it was held in a small gallery in a village in the mountains... The gallery is called Fabrika, and they have organised it really nicely; it even has a mechanised roof so that the venue can be open air in the summer and closed in winter. The artist: www.mathewhalpin.com Unfortunately, I didn't find a website for the gallery itself. They allowed our dogs inside too, but this may depend a bit on who is exhibiting and whether or not they like dogs. I had been to this village before, but had never really explored properly. I loved it. Everybody was extremely friendly, both to us and to our three dogs (!). They have really worked hard to restore the traditional architecture of the houses and the village is extremely beautiful, with narrow winding streets full of bougainvillea, jasmine and geraniums. It still has the feel of a functioning village, however, where people actually live, rather than a stage-set for tourists to admire. 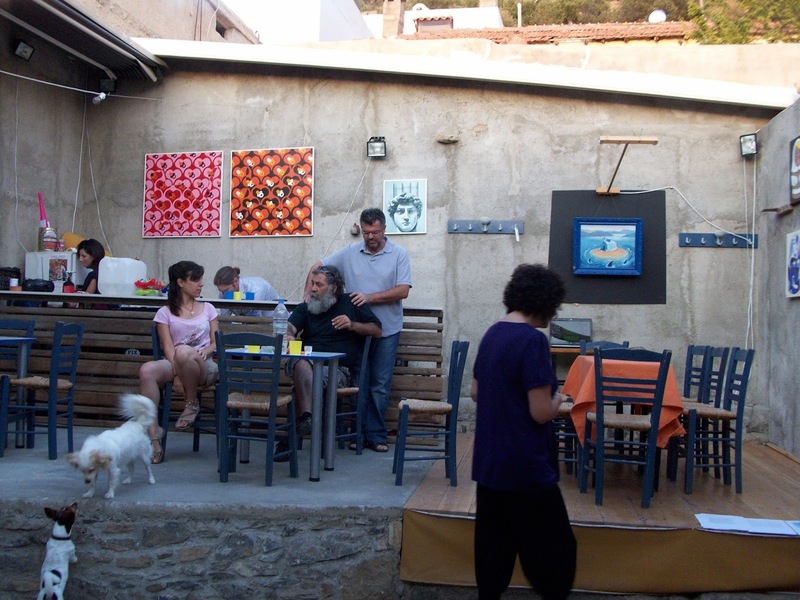 I especially liked it that it was a group of local residents who had started the exhibition space, and were inviting artists from all over Crete to come and exhibit and discuss their work. There is not a lot to do in the village. 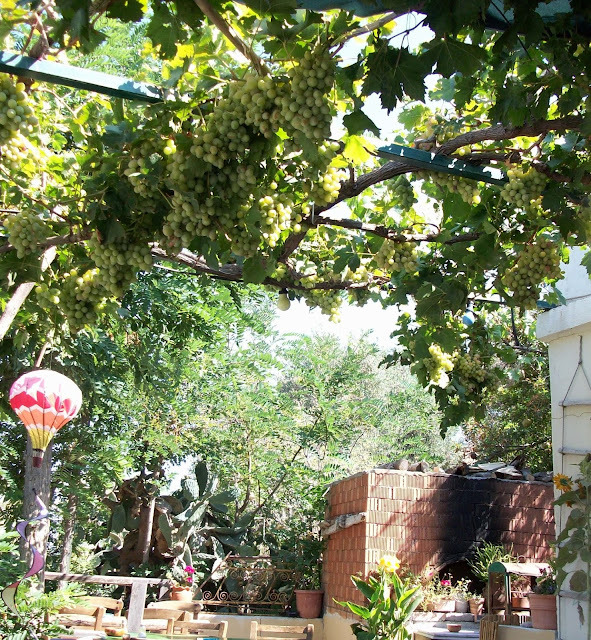 You walk around nosing at peoples' houses, looking at the plants that fill the courtyards and streets, and admiring the view. There is a small shop, but I didn't find it. There is also a kafeneio, again, I didn't go there. We kept finding our way back to the lovely Kath'odon Taverna (Roadside), with the incredible views over the Mirabello Bay. They served a basic breakfast (omelettes, toast, that kind of thing), as well as lunch and dinner of course, at reasonable prices. 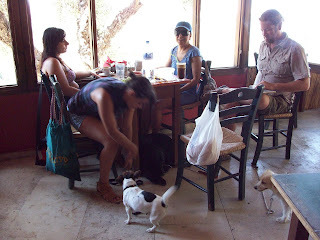 They didn't seem to mind when we sat there just for a coffee, and again later just for raki and mezedes. They were fine about our dogs, although probably would have preferred if Betty (the boldest of the 3) didn't find her way in there alone and start begging from the other customers. There was a nice mix of tourists and local residents eating there. 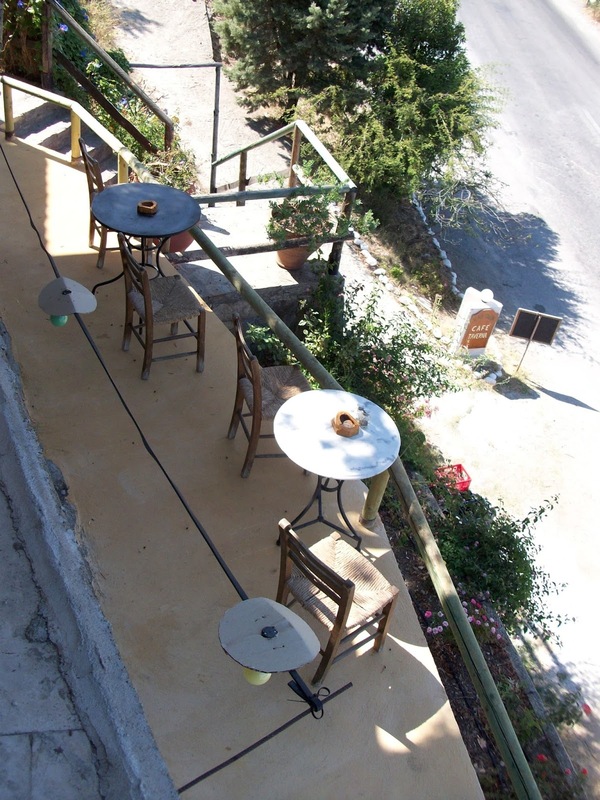 I also liked that the taverna stayed open quite late at the weekend, providing a little bit of nightlife to the village. Here is the Facebook page for Taverna Kathodon: https://www.facebook.com/pages/Taverna-Kathodon/197882956957077 This would provide a good rest stop on the road going to east Crete too. 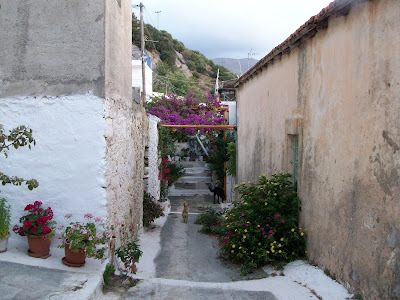 While the beaches in East Crete can be a bit strict about dogs (especially in the Itanos district), there are many great places to go in this area with your dog. This looks amazing! How cool that this village have funded and built their own gallery space. And how refreshing that you were actually allowed to bring your dogs into the gallery! It is a very special place. 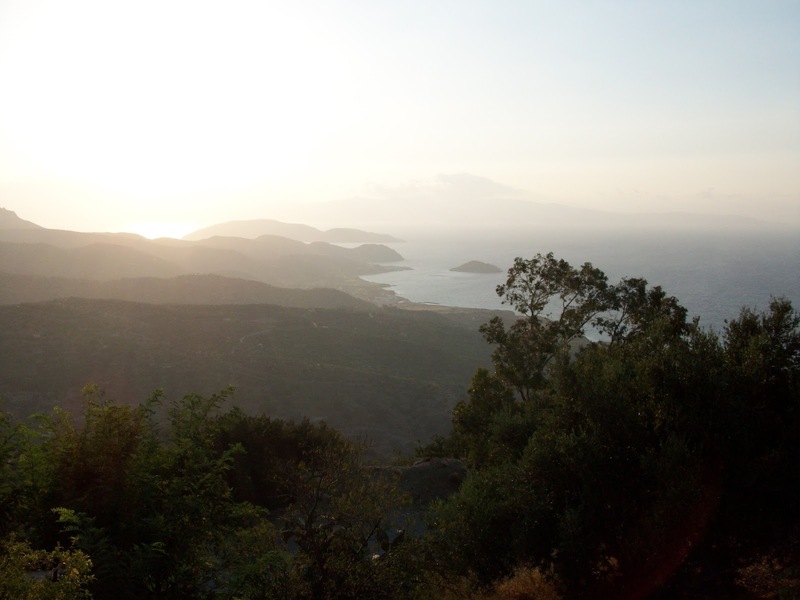 I don't know where you are based - but I definitely recommend a trip there if you are in Crete!